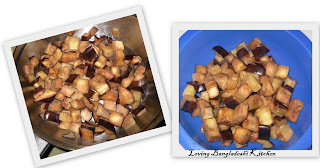 Wash the eggplant and cut it into cube size pieces. Take Vinegar, soy sauce,Sugar, black pepper and Salt in a bowl and mix it well, and set it aside. Heat 3 Tbs oil in a pan in a medium heat and fry the eggplant until it become little soft and then remove it on a plate. Then heat the rest of the oil. Put the whole red chili (if you want it hot you can break the hole chili into small pieces) into the oil and fry them 5 seconds. Then put the garlic and onion in the oil and fry them until they become soft. When onion turns to soft put the eggplant in it and pour the mixture of bowl on the eggplant and mix them well. Then cover the pan, lower the heat and cooked it in a low heat for around 8-10 minutes or until the eggplant become completely cooked. Then turn off the heat and serve your fry with plain rice or pulao. Mix flour,sugar and salt. Add water and mix well. Keep the batter aside. 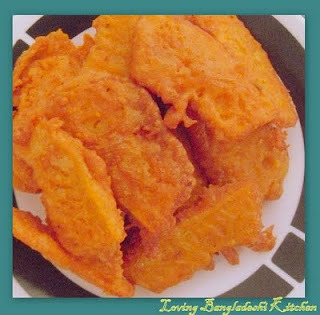 Heat 1 tbs oil in a pan in medium heat and make egg fry(ডিম পোঁচ). Heat Oil in a pan in medium heat for deep fry. Dip fried egg in the batter and put in the heated oil. Fry both side until golden brown. Remove it from oil to a paper towel to remove extra oil. Again dip it in the batter and fry it. Repeat this process for 4-5 times. Cut with a knife and serve. Peel and wash bottle gourd. Grate and keep aside. Add 5-6 cup water in a deep pan. Bring it to boil. Add grated bottle gourd. Boil it around 7-8 minutes in medium heat. Remove from the pan and drain water properly. Heat ghee in a pan. 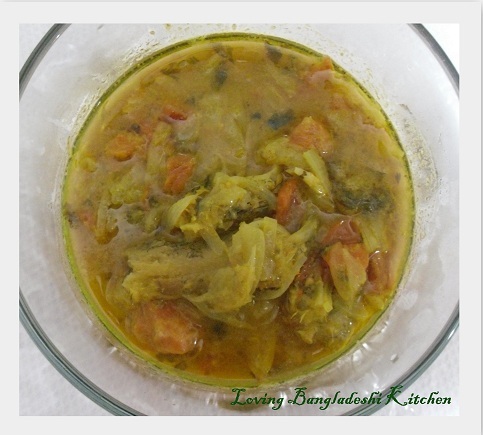 Add bottle gourd and fry around 10 minutes. Remove from the pan and set aside. Heat milk in a heavy bottom pan. Bring boil and then turn the heat in medium. Cook until it become almost half. Stir occasionally to prevent burn bottom of the pan. Add sugar and cook around another 10 minutes. Add cardamom powder and stir. Add fried bottle gourd and cook around 10-15 minutes in medium heat. Remove from the pan and garnish with chopped almond or pecan. Allow it to cool and serve. Peel the banana and mashed it smoothly. 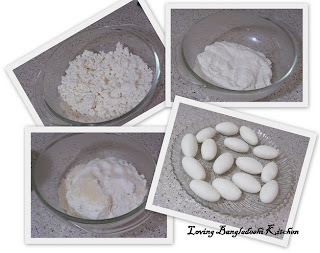 Take rice flour, flour, sugar, salt, baking powder in a bowl and mix them well to distribute all things evenly. Now take the mashed banana in a mixing bowl, add the dry ingredients small amount at a time and knead them. 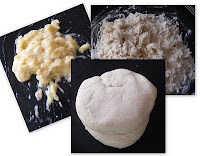 Add water slowly and make it like a dough consistency. Knead the dough well to make it smooth and lump free. Then keep the dough to rest for about half an hour or more. Divide the dough to small balls. Brush little oil on a plate, take a ball and press it on the plate to make it around 1/2 cm oval shaped disk(like shown in the picture). 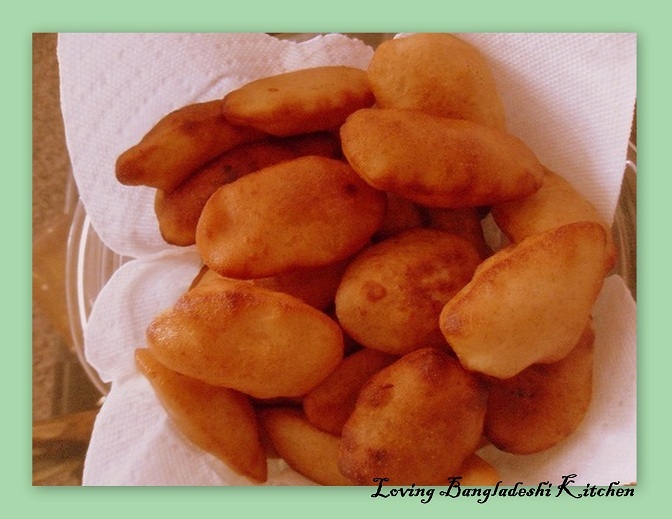 Fry all the rest of pitha in the same process and serve hot. 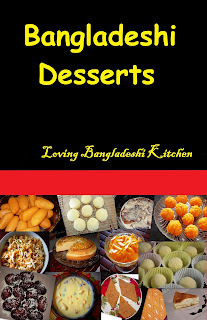 *** When pitha become cool it may be seems little hard to eat. At that time boil some water in a pan, put a steamer on the pan and place your pitha on it and cover it. 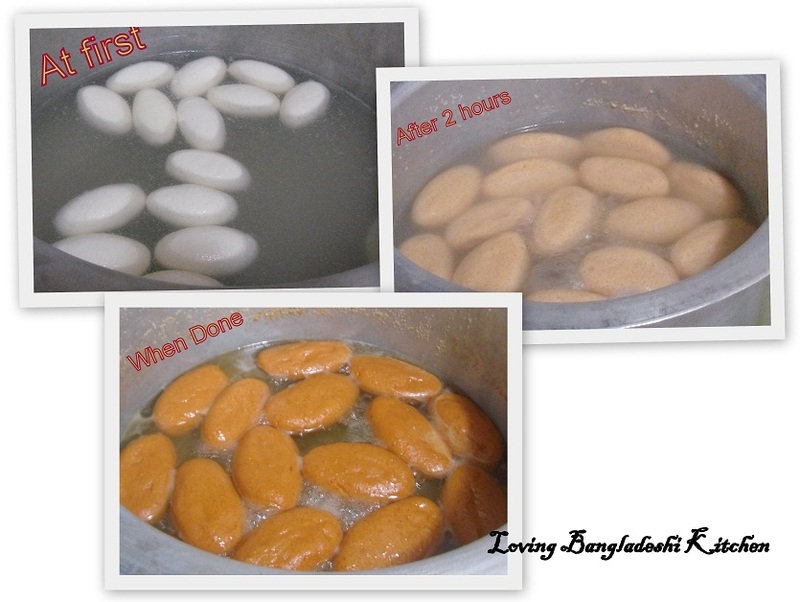 Steam your pitha around 5-8 minutes and then take out and enjoy. 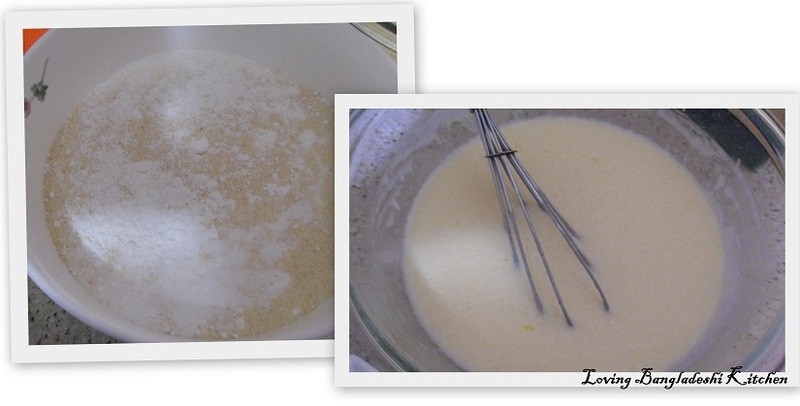 Melt the butter in a mixing bowl, then add milk/yogurt, sugar, and mix them well. Beat the egg in another bowl and then add it in the butter mixture and beat them well. Take semolina, baking powder, nutmeg powder and cardamom powder in a separate dry bowl and mix them to distribute baking powder evenly with semolina. Then add the dry mixture in the liquid mixture and mix them to make a smooth batter. Now brush the baking pan with oil/ghee and pour the batter on it and smooth the top with a spoon. Then keep that in the refrigerator for 1-2 hours to set up. In the mean time, take sugar, water and lemon juice in a pan; and bring it to a boil. Then add the honey in the syrup and let it simmer in medium heat for around 10 minutes. Then turn off the heat and keep it aside to cool down. 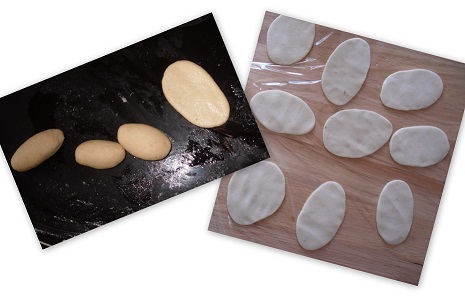 Take out basbusa from the refrigerator and score it into desired shapes. Place the almonds on top of each square or diamond shape. 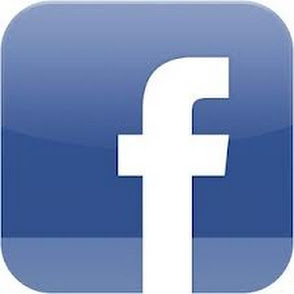 Preheat the oven at 350°F/170°C, put the baking tray into the oven and bake it for around 40 minutes. It will be better to start checking your cake after 25-30 minutes. Carefully take out the cake from the oven and pour the syrup on the top of the cake and then bake it for another 15 minutes. Then cut again along the score lines and let it cool completely before serving. Take besan in a mixing bowl, add ghee and water and mix them well so that no lump remain in the batter. Now separate half of the batter in another bowl and add food color in it. Heat sugar and water in a pan to make syrup. When syrup start to boil, lower the heat and keep it in lower heat to simmer. Heat the oil to a medium heat. When oil is heated enough, place boondi maker over the oil, pour some batter on the spoon and slowly tap the spoon to drop the batter in the oil like small size balls. If pan become full, stop to drop batter and fry the boondi until they all become light golden brown. Then take them out from oil and put in the syrup. Fry the rest of the batter in the same process and put them in the syrup. Occasionally mix boondi with syrup. When all batter is done turnoff the heat and mix all boondi with syrup, then move them to a plate and keep them to cool down slightly to handle with hand. Now take your desire amount of boondi in your pulm and press them to make a round ball. 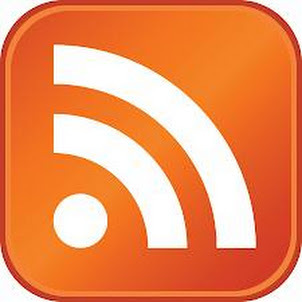 Once form the round shape press little harder to form a tight ball. 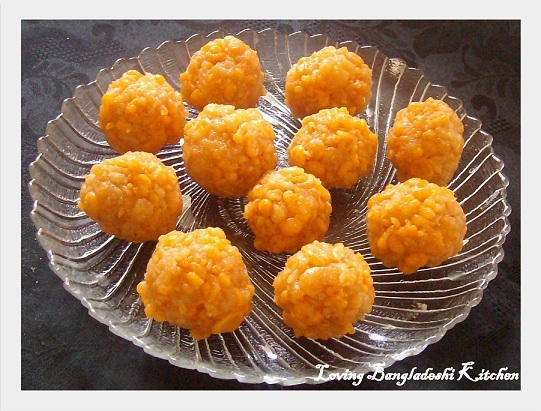 In the same process make all the laddu. Serve your laddu to make everyone happy. Cut the fishes to your desire size, then clean and wash them properly. Heat the oil in a pan. 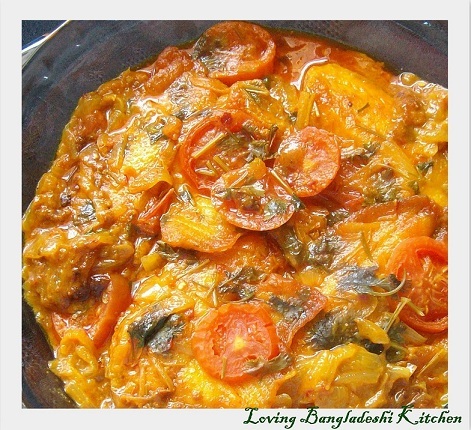 Put the onion and half of the chopped tomato in the oil and fry them until they become soft. Then add garlic paste, green chili paste, turmeric powder, cumin powder and salt, and stir all the masala until oil start to separate from masala. Now put the fish in the masala and carefully coat the fish with masala. Then add around half cup of water and cover the pan. Cook fish around 6-7 minutes and then carefully flip the side of fish (if it seems to become too dry your curry add little bit water), add remaining tomato and coriander leaf, cover the pan and cook again another 10-12 minutes. 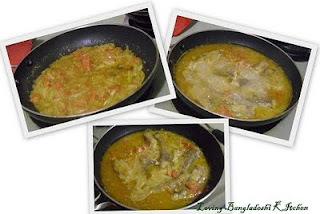 Then turn off the heat and serve your curry with plain rice. Wash the pumpkin, peel it and then slice it into around 1/2 cm thick pieces. Then spread pinch of salt on the slice and keep it aside. 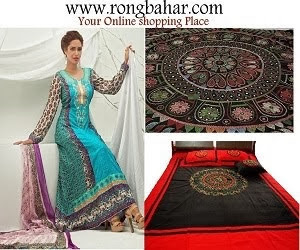 Take besan, rice flour, ginger paste, garlic paste, turmeric powder, red chili powder, cumin powder, baking powder,salt in a mixing bowl and mix it well to distribute all ingredients evenly. Now add water into the dry mixture and mix it well to make a smooth batter. Then keep it aside for around 30/35 minutes. Heat oil in a medium heat. When oil is heated enough coat the pumpkin slice with besan and then carefully put it into oil. Put another 4/5 pieces into oil and fry both side until a nice golden brown color shown up. Then take them up on a paper towel to soak extra oil. Fry the rest of pumpkin slice in the same process. 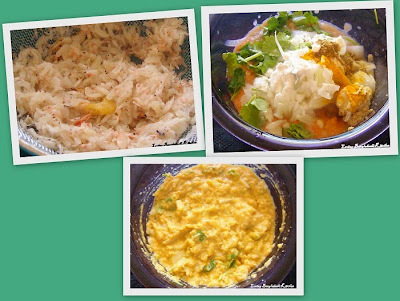 Enjoy with khicuri or plain rice or simply with ketchup. Wash and peel pumpkin and cut into small size. Boil 1 liter water in a pan in medium heat. Add pumpkin. Boil pumpkin until tender. Drain water. 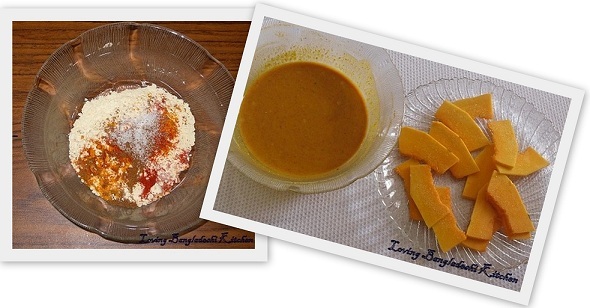 Place boiled pumpkin in a blender and make paste. Heat ghee in a pan in medium heat.Add pumkin paste and sugar. Stir it until it get halwa consistency. When it become almost done add food color. Serve according to your desire shape. Cut each orange in half. Squeeze juice from 3 orange with a lime juicer or hand. Put the juice in a blander. Add sugar and ice cube and blend it . Squeeze juice from the remaining 1 orange with hand that make some pulp. Mix both juice together with a spoon and serve. Cut pumpkin flower off where the pumpkin starts on. Take the center out. Wash and drain water. Place all the ingredients in a mixing bowl except flower and oil. Add around 3/4 cup water and mix well. Batter should be thick but not too thick. Heat oil in a pan. Dip the flower in the batter to coat and gently place in the hot oil. Fry until both side golden brown. Remove from the pan and place on a kitchen tissue to soak extra oil. Place all ingredients in a blender without ice and finely blend it . Serve it in a glass with ice. After hanging chaana for about 1 and half hour take out it in a mixing bowl and knead it well(knead around 15 minutes) until chaana become soft(instead of kneading you can put chaana in the chopper or food processor for around 40 seconds). Then separate the chaana to your desire(this size should be half of your final chomchom, because it will be almost double in size in the syrup ) size ball. Take one ball, press it and then round it to the chomchom shape. Make rest of the ball. Pour water and sugar in a large pan and heat it to the medium flame. When syrup start to boil, put all the chomchom and cover the pan. When chomchom is done, cool it down, decorate with Maowa and serve. Wash dal. Place it in a bowl. Fill it with little hot water and keep it for 2-3 hours. Drain water and place dal (lentil) to a blender. Blend it. Don't blend too finely. Remove the dal from the blender and set aside. Clean and wash shrimp. Put it in a blender. Add green chili and make a paste (add little water if required). Place pasted shrimp and dal to a mixing bowl. Add rest of the ingredients except oil. Mix all of them very well. Heat oil into a frying pan. Place 1 table spoon of mixture into frying pan in round shape. Fry them in a medium heat until both sides looks deep golden brown. 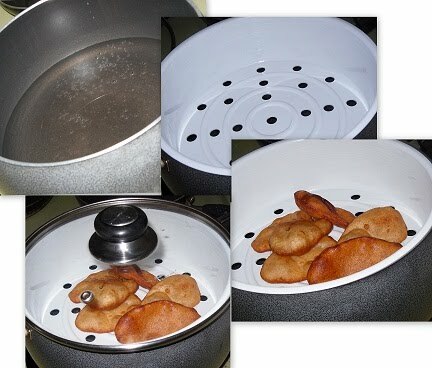 Remove them from the pan and place on a kitchen tissue to soak extra oil. Clean and wash the fish properly. Add 1/2 ts of turmeric powder and 1/2ts of salt to the fish, and coat them well with the fish. Now heat the rest of the oil. Then add the chopped onion and chopped tomato in the oil, and stir them until they become tender. Then add garlic paste, rest of turmeric power, red chili powder, cumin powder, chili garlic sauce, green chili and salt, and mix them well. When oil start to separate from masala, add the fishes in it and carefully coat them with masala. Now add around half cup of water, place the sliced tomato on the fishes and cover the pan. Cook the fish around 7-10 minutes. Then add the coriander leaf and cover the pan for another 1 minute. Then turn off the heat and serve your fish with white rice or pulao.